Some of the world's best desserts and indeed best ice cream comes from France. It's the country where custard was created and where Thomas Jefferson found culinary inspiration during his time there as US Minister. So much so that he brought back with him ideas about ice cream making and wrote down what is believed to be the first, definitive ice cream recipe in the USA. During my travels to France I have come across many fabulous 'artisan' ice creams. In France a master ice cream maker is called an artisan glacier - a much respected title and when you see and taste their ice cream it's not surprising why! It's not just the taste and texture of French ice cream that's great, it's how it looks. The French love to present their food in colorful and stylish ways and ice cream is no exception to that general rule. 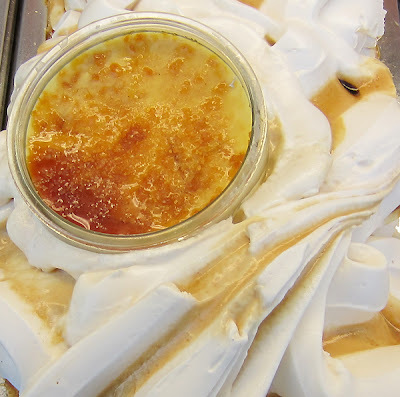 Here is a creme brulee ice cream I came across in a French ice cream parlor, presented with nothing less than a full creme brulee dessert on top! I developed my own creme brulee ice cream recipe and I have to say it is truly one of my favorites. Creamy and rich with a succulent vanilla taste it's fab on its own or served with a hot dessert such as crumble or sweet apple pie. On the subject of what you can serve your ice cream with, that's another thing the French are great at conjuring up .... a hot crepe or waffle is simply sumptuous smothered in ice cream and chantilly (not forgetting the chocolate sauce!). 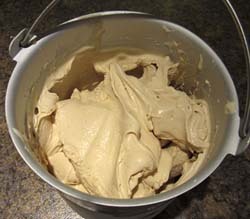 Check out my creme brulee ice cream recipe along with a slide show of me making the ice cream. Have fun and enjoy!